Based out of the Minnesota Department of Natural Resources Hutchinson office, Brad has worked as a Fisheries Technician for over 30 years and got into the field because of his extreme passion for hunting, fishing and the outdoor world in general. Brad’s duties cover a wide of responsibilities inventorying aquatic resources, assessing aquatic habitats, and resource exploitation by completing lake and stream surveys. In addition he conducts environmental reviews, fish propagation and distribution, along with making presentations to anglers, citizen groups, fairs, school groups and the general public. Brad Koenen graduated from Brainerd Central Lakes College in 1977 and started his natural resource career with the DNR on the Department’s first Hotshot Firefighting Crew battling forest fires in Minnesota and on the West Coast. 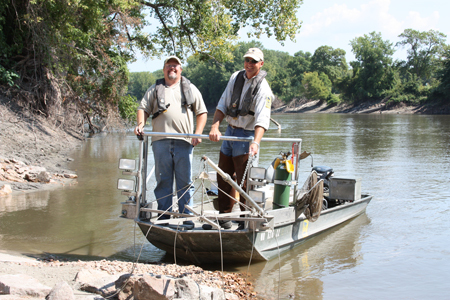 After spending two years in Illinois working on habitat and assessment projects he came back to the MN DNR to work first at Crystal Lakes Hatchery and finally to Hutchinson in 1983. See the Fish section for videos featuring Brad Koenen. 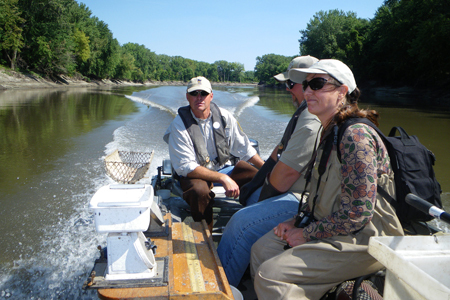 Brad Koenen (center) driving a boat to do some fish sampling. 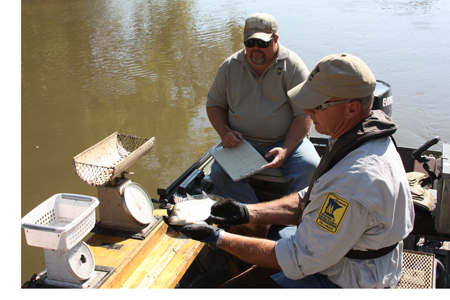 Koenen (right) holding up a White Bass that was sampled.